Workers at Australia's major airports will face additional screening measures as part of a security crackdown. Australian baggage handlers and airport staff working in restricted zones will now be subject to random tests for traces of explosives. Inspections will also be carried out on employees' belongings and vehicles. The changes follow concerns raised by union and intelligence experts about the screening of staff, many of whom are on casual contracts. Does a surge in airport security work? "These measures strengthen existing controls to ensure airport workers are authorised, properly identified and appropriately trained before entering secure airside areas," Transport Minister Darren Chester said. The government said about 140,000 workers had access to secure zones in airports. One senator, Nick Xenophon, said Australia should adopt even stricter measures, such as a US-style system of mandatory checks for all staff. "Our government's approach to random inspections is a joke," he said. 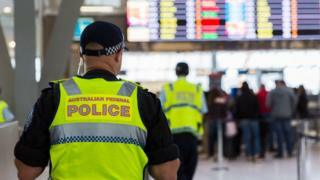 Australia terror probe: Does a surge in airport security help?